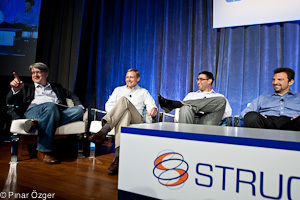 Dante Malagrino (far left) at Structure 2011. Embrane, which builds tools that will enable cloud providers to scale out networking services faster and with less complexity, has raised $18 million in Series-B financing led by New Enterprise Associates. Existing investors Lightspeed Venture Partners and North Bridge Ventures also participated in the round, bringing the company’s total funding to $27 million. Embrane is in the networking sector, which is heating up as virtualization complicates communication between servers and data centers. It plans to use this money to boost sales and marketing. The company’s product, which is currently in beta, allows companies such as Rackspace (s RAX), Verizon (s vz) or hosting companies building out Infrastructure-as-a-Service offerings, to add virtualized services at Layers 4 through 7 of the networking stack. In laymen’s terms, these layers encompass everything that’s not the actual movement of packets, and include services such as load balancing, firewalls, virtual private networking and others. “We think that what the cloud needs is not a better version of these services; the cloud needs a better way to deliver these services,” says Dante Malagrinò, CEO of Embrane. He explains that the existing appliance model goes against the cloud, while the newer effort to deliver virtual networking appliances on top of commodity services just adds complexity to the cloud management, because virtual appliances don’t scale well. So Embrane’s software is designed to sit on commodity x86 servers, but to scale better than previous virtualized appliances. Instead of taking an architecture designed for old-school data centers and putting it on servers, Embrane has designed products built with highly virtualized and distributed servers in mind. However, it’s not tying itself to one standard or the eventual hope that networks will become virtualized using technologies such as OpenFlow. “Today, the installed base is not using OpenFlow or software defined networking. We want to work with whatever the customers have in place … OpenFlow doesn’t help you at Layers 4 through 7,” said Malagrinò. However, OpenFlow is gaining mindshare, as are virtualized networks. On Wednesday, Big Switch, a company that is building a controller for software defined networks announced a beta version of its product. Malagrinò expects Embrane’s product to launch at the end of this year. I expect we’ll see more networking-related announcements in the next year as vendors try to meet the demand for programmable networks and more agile service delivery. For more on this trend, check out this panel from Structure with Big Switch’s Guido Appenzeller, Nicira’s CTO Martin Casado and Malagrinò, discussing the opportunity.